Even though the government burbles on about New Zealand developing a “Knowledge Based Economy” to see us become a leading edge “developed” country forging ahead into the 21st century, the fact remains that farmers are still the backbone of our national economy. Sure, the farmer is now a highly educated business manager, but cows & milk, sheep & wool, that’s still what we are about. 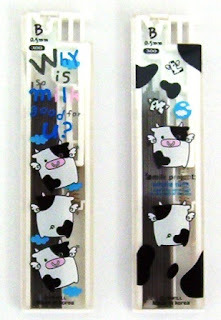 So there I was in the “Morning Glory – Brand of Reliability” shop and I saw this pencil, “Milk Project:Whole Milk” brand. Now what’s that all about? Photo: On the pencil is printed “2% Lowfat Milk. Milk Project:Whole Milk. It is fortified with skim milk and has 10 grams of protein per cup”. Yes, um, not exactly “Whole Milk” then? Well this is New Zealand, land of milk and cows, so a pencil covered in cows and calling itself Milk Project:Whole Milk can’t be entirely inappropriate. But a Korean stationery manufacturer and shop? Some scheme by the Korean government to get them to drink more milk? Who knows? These lead containers are rather reminiscent of those made by Micro, so they might be the manufacturer. They are actually spring loaded containers. You press down the right-hand section to open the container, and its clicks down and holds. You then press it again and the spring mechanism pushes the section back up again and closes the container. Photo: On one container is printed “Why is milk good for U?”, on the other in very small print is “I could fly very high to the end of the sky”. Note how the cows have tiny wings and are flying up, up and away. I haven’t been able to find out anything much at all about Milk Project:Whole Milk. It appears to be a franchise type brand of this particular company (http://www.skgood.com/ - Broken link). I did however trip across this rather interesting blog, by a young American school tutor on some sort of exchange programme in Korea. 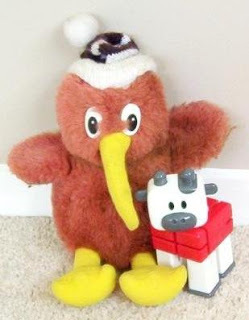 Just a side-note, I have recently become aware that I might be confusing some people when I use the term “Kiwi” to refer to us “New Zealanders”. People think of the fruit or the shoe polish when they read Kiwi, not people from New Zealand. Well just to clarify, the kiwi is a large flightless bird endemic to New Zealand and one of our national icons, but Kiwi is also our informal name for ourselves, the people of New Zealand. Its birthday time for this blog. One year old, must say I have enjoyed my first years blogging. Actually it’s close to my own birthday too and I’m at that age when you start to wonder exactly what you’ve done over the last year, and ask yourself things like “Just how have I ended up as this pencil geek guy?” With this blog I’ve put a part of myself out on display to the world, and since many would consider it a somewhat geeky sort of part, I feel compelled to try and balance the scales a little bit. Whilst I have always been a pencil person, I used to keep it pretty well hidden. These days my birthday involves thinking about things like what nice new pencil I might get, but 15 or so years ago (it seems only yesterday) my birthday was more along the lines of…. 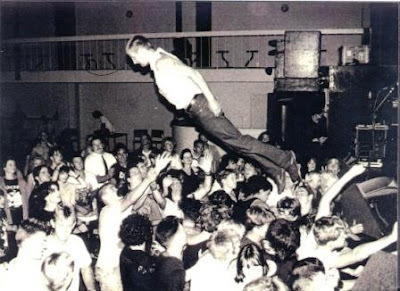 A few drinks, a few bands and “getting a little air” to blow away the cobwebs of a working week. I love this photo, but as keen as I was on getting some air, I must clarify that this particular diver is my good friend rather than myself. But I am in the photo. That was a great 25th birthday. How times have changed. Might just delete this posting after a while! When I look at the Diplomat I am often reminded of another of my favourite pencils, the Caran d’Ache Ecridor. The hexagonal body, patterned finish, silver colour and tapering front section are all somewhat reminiscent of the Ecridor. After a few wipes with a polishing cloth, the Diplomat really is very shiny. In different lights and at different angles you get all sorts of optical effects from the wave decorative pattern - the colour seems to change a bit, and the pattern varies widely from waves through to a checkerboard sort of look. Very nice. The wave pattern on mine doesn’t appear to be available on current Diplomats. The YOL website only lists plain and barley finish as currently available. Barley is somewhat similar, though larger and coarser, compared to the very fine wave pattern on my old Diplomat. There is a plain section on one face of the body if you want any personal engraving. Remember that this pencil is made from solid sterling silver so it does slowly tarnish and you need to give it an occasional polish. Overall the weight of the Diplomat is less than I would expect from such an all metal pencil – 23 grams (3/4 oz) vs 32g for YOL Deco 34 and 32g for Cd’A Ecridor. Possibly modern Diplomats are heavier. I tend to hold my Diplomat where the round conical tapering tip merges into the hexagonal body, so I am getting a sort of feel like a hexagonal pencil, plus a round section as well. I would rate the grip about average, as there aren’t any real grip-enhancing features, but silver pencils never seem to be too slippery. I think I would prefer the pencil to be just a little bit longer, as it’s possibly just a fraction too short for a “big-handed” person. Just going back to the tip for a moment, this is one area where I disagree with YOL’s statement about the Diplomat being unchanged. From website pictures, the tip on modern Diplomats is just normal silver, part of the main body and cone, but on my Diplomat (and other old ones I’ve seen) the last 9mm of the conical tip is a completely separate piece and is made from a light brass or gold coloured metal – not sterling silver. Maybe it’s something like 9 carat gold. The pocket clip on my Diplomat is a bit “sprung out”. It doesn’t touch the main body so doesn’t really work on thin fabric like a normal business shirt pocket. I assume that it’s become sprung out from use (or abuse?) over the years as the clip on my Deco 34 is a lot closer to the body, and works well except that it is a very stiff clip. Like all YOL’s the diplomat uses 1.18mm lead. You know, as I’ve used thicker leads over the course of this blog I am becoming more accustomed to them. I bought my Diplomat with a full yard of lead inside it, so I’m still using that. The grade is much lighter than my usual HB. Currently YOL sell B, HB and H grade, but I think its lighter again, something like 2H, unless their scale is quite different to other manufacturers and there is a huge difference between their HB and H. It really is a bit light for me. But there is absolutely no graphite dust when you write, and you don’t have to advance the lead very often at all. 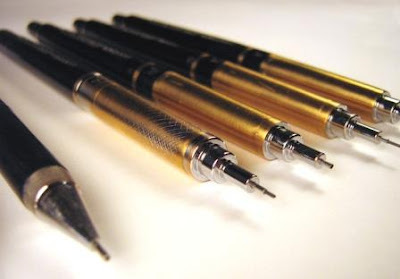 The lead advance mechanism is a screw mechanism, activated by winding around the top cap of the pencil. The leads winds in and out, so you can retract it for storage purposes. Twelve 3 inch leads are stored inside the body to give you your yard of lead. Refilling is a bit of a complicated procedure, as shown in my pencil refill instruction posting. Certainly modern mechanisms are far more convenient in this respect. Photo - Lead advance mechaism and several sticks of refill lead partailly pulled out of body. Best Points – The looks and changing effects from the wave pattern. Not So Good Points – Perhaps this pencil is just a little short. Lead replacement is a bit of a mission. Offering a thinner lead would also be good. But then again, the thick lead and old fashioned mechanism are part of the tradition and charm of these sorts of pencils. 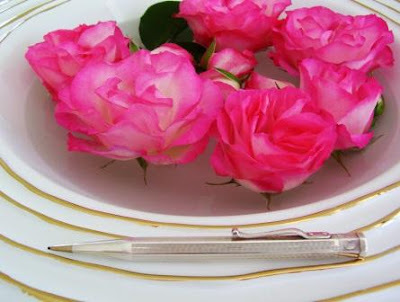 There is no eraser with this pencil - sometimes something is better than nothing. Still waiting for them to invent truly non-tarnish pure silver. Price Range – Stratospheric. An awful lot less for a good condition pre-loved one, but you probably won’t get any presentation box, etc like you do with a new one. Dimensions – Length 118mm, width 8mm across the hex flats. Balance point about 65mm up from the tip. A little trivia – Yard-O-Led sell Lead refills, not Led refills. 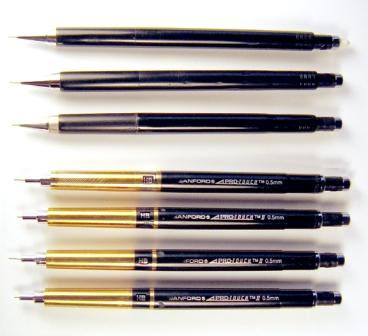 Until the early 90's I had always used Staedtler Mars Lumograph wood pencils for my illustration work. I grew increasingly tired of having to sharpen and shape the ends though, so I decided to try mechanical pencils. With not a lot to choose from and my knowledge base limited (this was pre-internet for me) I settled on a Pentel Sharplet 300 that I used with the unwieldy cap / top half removed. It was short but it did the trick. 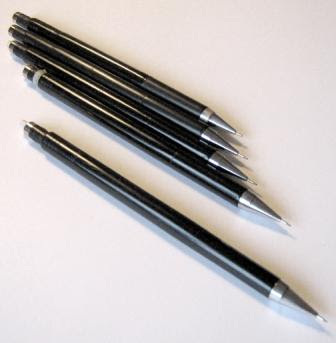 This lasted me until the late 90's when increasing frustration with the cost and bother of the short eraser style of the Sharplet started me looking for another mechanical pencil. I loved the Technician when I first found one in a small out-of-town stationary store in 1998. It had the perfect twist eraser for me (no more pulling out and reinserting short eraser bits every day or two), the perfect length and weight, but it also the hated rubber grip. For an illustrator with a tight pencil style this was unacceptable. So I decided to see if I could customize the Technician to my needs. The first step was to find more of the pencils. Unfortunately Sanford had just stopped producing the pencil! (They later started manufacturing it again under the Papermate brand, but have since stopped producing it again! Apparently the Papermate Apex - with a much thicker barrel and large retracting tip - has replaced it.) After a fruitless search through local and Canadian suppliers I finally found four Technicians and four ProTouches from an art supply firm in the US and bought all their remaining stock. To customize the Technician I first tried replacing the rubber grip with epoxy glue but this didn't work for me. I then tried hot glue that I let cool and planned to cut / sand to fit. Unfortunately the glue wouldn't sand well so I had to move on. Photo - Staedtler 9505 (times 2) and a Sanford Protouch II. These were failed attempts at replacing soft rubber grips with something harder. Shaped hot glue = not so good. I removed the rubber grip and replaced it with an appropriate length of barrel from a Pilot Fineliner felt tip pen that I cut to size. I used epoxy to fix it to the existing barrel. I then hand sanded the entire length of the pencil to smooth it out and even the two barrel sizes. I also sanded the slightly-too-sharp-for-my-taste top edge of the pencil where the eraser fits in. Lastly I sanded off about 1/3 of the length of the small metal tip that holds the lead because it stuck out further than I wanted. Photo - A close up of the business end of the customized Sanford Technician II that I've drawn 98% of everything I've illustrated since 1998, the year I first bought and adapted this. Photo - Three of my four back-up Technicians and my four back-up customized Sanford ProTouch II's. The ProTouch is essentially the same as the Technician from the grip up. Perfection! Eight years of daily use (sometimes 12-14 hours a day in my hand) with no comfort issues, no mechanical problems and no breakages has proven this pencil is the right one for me. Photo - One customized Technician ( left ) and my four customized ProTouch pencils. The ProTouch's have been sanded to smooth the rough grips and to reduce the length of the lead sleeve. Photo - My five customized Techinicians. The one with the tape on the end holds a slightly harder lead (H instead of F) that I use occasionally depending on the paper I use. Just in case you are interested, Glen’s pencils are 0.5mm, and he usually uses Pentel leads in H or F grade. All photos by Glen. Check out Glen’s website here. Also check out this earlier guest review of the “unmodified” Technician by Eric. I thought I would start the year off with a little bit of colour, so the first review of the year is Uni ‘-ish’ Coloured Leads by Mitsubishi Pencil Company of Japan. First up, I had better reveal the fact that I have never ever used coloured mechanical pencil leads before. So I’m a first timer and can’t compare them to anything other than ordinary graphite mechanical leads, and wooden coloured pencils. Not that I use wooden coloured pencils very often either. The only –ish leads I have seen around in my part of the world are 0.7mm and sold as a mixed pack of 12 leads, 2 each of six different colours. I haven’t been able to find much information on the web about them, but it appears –ish leads are also available in 0.5mm, and some colours are available as packs of one colour only but aren’t branded as -ish. The lead container is a normal size one and the clear top half-round section simply pulls off to allow access to the leads. The leads are in six little divided sections within the container. It’s a good system, except it is a little difficult to just get the one colour you want. You basically have to shake them all out a bit, choose the one you want and push the others back in. On the down side though, there are some issues with strength. I certainly had some breakage problems, red in particular seemed to be a bit prone to breaking. 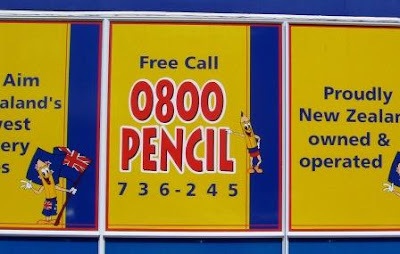 Strangely though, the break often occurred up inside the pencil, rather than snapping off down at the tip. Another problem was that the lead tended to crumble under pressure. When you press down hard, particularly as you first start writing, a few little specks crumble off and so you get the equivalent of graphite dust left floating around on your page. I found the blues to be a bit worse than the other colours for this crumbling. 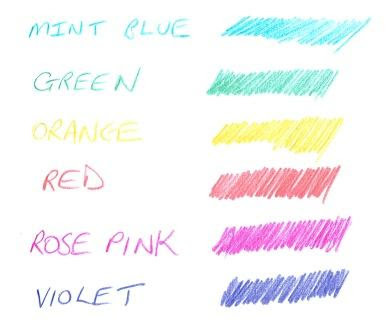 Mechanical pencil coloured leads only have a small colour range compared to wooden coloured pencils so I guess they aren’t really aimed at the serious art market, but rather at those who just want a bit of colour. (Sorry, I just can’t resist the thought of teachers and their red pencils.) Uni also have a mechanical pencil model “–ish” which they appear to market as their fun vibrant “colour-shock” pencil. It comes in the same 6 colours as the leads so it’s all part of an integrated concept. For the final verdict then, Uni –ish leads are well worth a try. Ah well, holiday time is over and I’m back to work. Now I’m not that obsessed that I go looking for pencil things whilst I’m on holiday, but when they jump out and hit me in the face, I do take some notice. So here’s a few from my holiday. I resisted this retailers sign. A young relative was showing me their list of school supplies for the coming school year, and it included “2 x HB pencils – must be HB, and must not have erasers on the end. Please buy good quality pencils as cheap leads break easily”. Well fair enough about the “good quality” bit, but I’m surprised that erasers on the end are prohibited. Maybe reminiscent of something I once read about poking your eye out while erasing some writing?!? 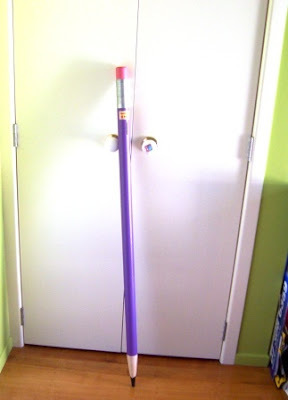 This is the biggest pencil I’ve seen in a very long time. Propped up against the wardrobe doors, it’s well over a metre long. Actually it’s a "money box" – there’s a coin slot just under the ferrule, and the fine print implies if you fill it with dollar coins you will have over a thousand dollars. The only pencil related present I got was a copy of “The New Drawing on the Right Side of the Brain”, to help advance my sketching endeavours. Thanks very much to those readers who suggested it. I’ve only got a little way into yet, but I’m sure it’s going to be really good. However the first exercise in left/right brain stuff gave me a thumping headache, the worst I’ve had in years. It lasted halfway through the following day. I totally reject my wife’s scurrilous aspersion that the bottle of sauvignon blanc had anything to do with it. Totally unrelated - I had the headache long before I opened that bottle. “The Headache” – my copy of “Igor Stravinsky” by Picaso.